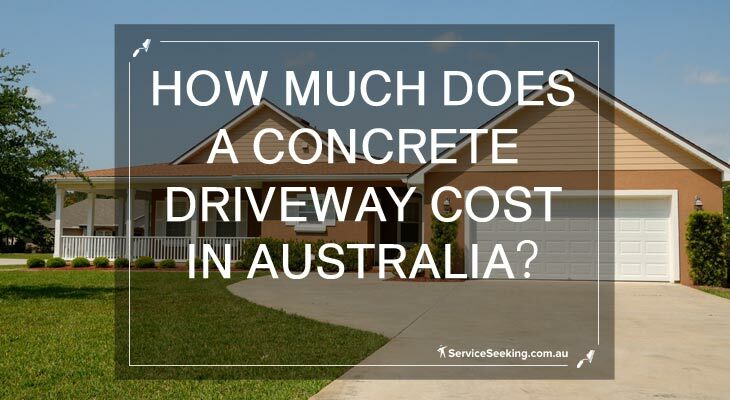 How Much Does a Concrete Driveway Cost in Australia? For a flat driveway concreting, the prices start at $65/m2. Given that you don’t need any special finishes for it, the maximum you can expect to pay is $85 per square metre. Besides the surface your concrete slab for a new driveway is about to cover, you need to think about the slope. If your driveway has a slope, that will cost you extra. The situation is a bit different if there is slope involved. It means that you will have to add at least $10/m2 for a gentle slope. Very complex and steep slopes will cost even more. The best idea is to consult with several concreting experts before starting your project. Concreters at Service Seeking will gladly give you their estimates and some tips. Another reason why you should talk to the experts is the fact that constructing a driveway in Australia means that you need to comply with certain local legislation. The size and the distance of your driveway are regulated by law. How Wide Should a Driveway Be in Australia? Keep in mind that you need to build a driveway on your own property and that includes the kerb tapers. Also, when adding the kerb tapers, they need to leave the room for communal drainage and they should not block it. The minimal thickness of your driveway concrete slab should be 10 cm. That is a standard that many people use. Given the table above, let’s say you are probably making a concrete driveway of around 16 m2. Now that your dimensions are all there, you need to start thinking about how you want your driveway to look. There are different finishes with different prices. 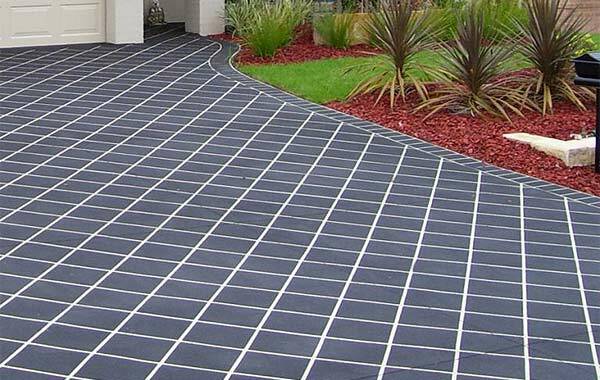 Which Type of Concrete Driveway to Choose? It all depends on your home, budget and taste. You can choose just a plain concrete slab and be done with it. That is the cheapest and the fastest option. However, before you go for a gray concrete driveway, take a look at what can be done to it. Maybe it will change your mind. How Much Does It Cost to Paint My Driveway? Concreting with coloured concrete starts at $10 per square metre. While you mix the concrete for your driveway, you can mix in the colour pigment to the water that you use for the concrete. In that way, the concrete will be in colour and your driveway will look nice. This is the cheapest way to do add some colour because it is only a matter of couple of dozens of dollars and a bit of mixing. Another way to colour your concrete driveway is to add powdered pigment to the wet, poured concrete slab. In this way, you will even be able to remove the colour if you change your mind, but the removal is difficult. 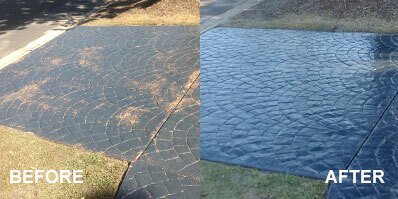 The third way to colour the driveway is to use a latex or acrylic colour on your driveway. This means that you have to make sure your driveway is spotlessly clean. Wash it and wait until it is completely dry. Then start adding the first layer of paint over it. You may need several layers of paint, because the colour will be a bit lighter than what you see in your paint can. A lot of people who want to do something interesting with their driveways opt for stencils and stamps. Stencils mean that different patterns and different shapes are painted over the driveway. In most cases, they ‘fake’ tiles and different shapes. Stamping has a similar effect, but it gives the texture to your driveway, as well. The shapes and patterns are pressed into the driveway. These two methods can cost you anywhere from $85 to $250 per square metre. Still, keep in mind that not all concrete driveways can be fixed and fixing will depend on the severity of damage. Your best and the smartest option is to make the calculations for different types of project. Put it all down on paper. Concrete aggregate are the stones and gravel in your concrete. This finish costs $100 to $150/m2 .When you polish your concrete in a certain way, you can expose those stones and that makes your driveway much more interesting and visually appealing. Additionally, you can polish that driveway to a certain shine. Normally, outdoor concrete slabs aren’t polished to a high shine, but they can have a smooth look to them if the polishing is done correctly. To achieve aggregate exposure, your existing driveway needs to be sanded until the adequate exposure is reached. Once it is sanded, fine polishing is the next action. When the required finish is achieved, it is time to put on some sealant and ensure the durability of that shine. You don’t have to pay all that money at once. It is possible to add these finishes later, if your budget permits only a plain concrete slab. There is always an option of concrete resurfacing later. This option is available for most concrete slabs and you should discuss it with the concreter who does your driveway. If resurfacing is something that you find interesting, mention it to your concreter and they will know what is the best way to go about your driveway to make the later project easier. Find a reliable and reasonably priced concreter for your project. 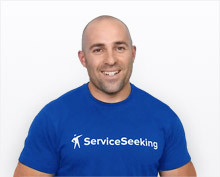 You can make sure you are not overpaying by asking quotes from concreters on Service Seeking. In that way, you can pick the prices that are within your budget and plan accordingly. How Can I Reduce my Air Conditioning Bill? What Is Cheaper for a Driveway Asphalt or Concrete?